In May 2011 the Provincial Grand Master R.W.Bro. Peter John Hosker re-organised the four central Liverpool Groups into two. 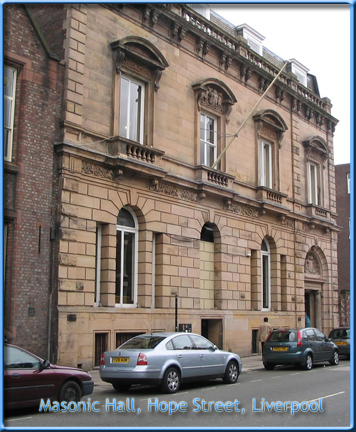 The new Liverpool Group (includes the former Sandon, Wellington and Trafalgar Groups), will be responsible for all the 37 Lodges and 21 Chapters that meet at the Liverpool Masonic Hall in Hope Street, whilst the Gladstone Group will remain and cater for all the Lodges and Chapters that meet at other venues in the city centre such as the Adelphi Hotel, Artists Club, Liverpool University and the Medical Institute. Some lodges hold many social events, including Ladies’ Nights, Old English Nights, Barbecues and various fund-raising activities, both for Masonic and non-Masonic charities. Charity is one of the great driving forces of Freemasonry and every member is encouraged to contribute regularly to this worthy cause. The sums raised enable the Freemasons’ Grand Charity to donate considerable amounts to nearly all the major National Charities and it is one of the major sources of charitable giving in the country. In addition the Brethren also support local charities as well as the Masonic charities in the Province of West Lancashire. There are some lodges where membership is encouraged from particular groups of people such as those who work in similar trades or professions, those associated with particular schools or the university, or ex-servicemen. The size of lodges varies considerably. One has over three hundred members whereas most have between thirty and sixty members. Each lodge is presided over by a Master and two Wardens. All lodges are connected by a regulatory body for the Province of West Lancashire and are held under the auspices of the United Grand Lodge of England. Young people should not feel out of place in Liverpool Masonry. The lower age limit for membership is twenty one and there are many members in their twenties and early thirties. At the other end of the scale there are many members these days that, because of work or other commitments, do not join until retirement. As will be seen, the scope for Freemasonry in Liverpool is very great. While space prevents a detailed analysis there is a variety of lodges in which any upright and honourable man, from whatever quarter in life, can feel at home, where he can make many firm and long-lasting friendships and where he can feel he is making a contribution not just to his particular lodge but to the good of society as a whole.